The good thing about living in the Boonies is, no traffic, no pollution, no noise, no people. The bad thing about living in the Boonies is, if something breaks, sometimes you have to fix it yourself and it might be heavy and you can't always drive to do it. 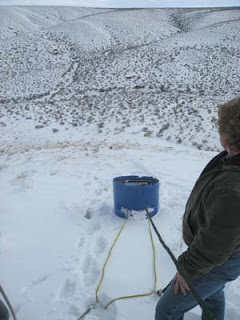 We do have wireless internet out here via a relay tower on the ridge, but once in a while it quits working. Like in the winter, when there's little sun, so the solar panel can't charge the batteries, and like in the winter when there's a lot of snow so that you can't drive way around and along the ridge to the tower. Then someone must either hike up new batteries or a generator or gasoline. Those can get pretty heavy. Especially uphill in the snow. 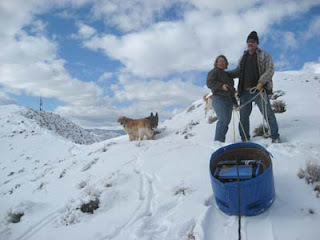 I missed out on the fun last year, but today I helped Carol and Rick haul a generator up the steep hill to the ridge in the snow (does taking pictures count as helping?). 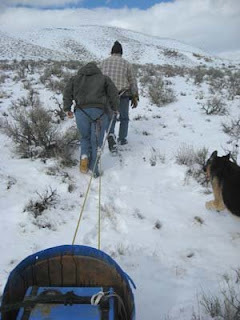 As Carol and Rick hitched themselves up with ropes to the barrel sled, we watched the dogs cavort around us and wondered whose job it had been to teach the dogs to get in harness and pull a sled. 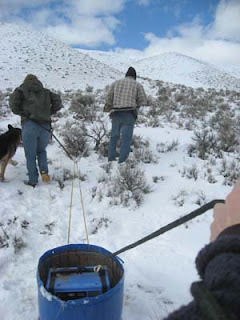 After much huffing and puffing, and after a few rest stops, we eventually got the generator up top. 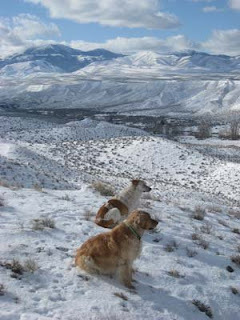 As Rick worked on getting it running, the dogs stood guard over Pickett Creek for us. 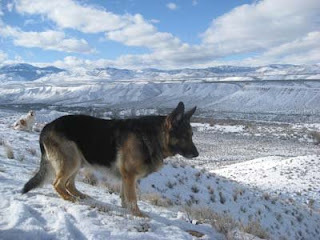 Then, because it was a pretty spectacular day, the dogs and I continued on a long hike in the snow - sometimes in knee-deep drifts - along the ridge toward the Owyhees. We hiked back home in the canyon through the creek bed. Great exercise, plowing through the snow. 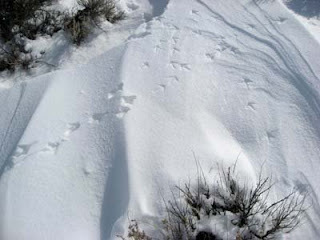 The best find of the day was these Raven tracks in the snow on the ridge. 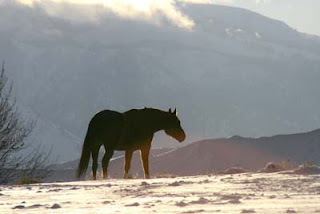 Out here on this winter day in the Sticks, there was no traffic, no pollution, no noise, no people - just me, three dogs, about 40 deer, 7 horses, and a pretty dramatic view on a pretty magnificent day. Quiet, peaceful, beauty. Love you posts, Merri.